DogParksUSA(TM) has been helping to develop dog parks since 1996. DogParksUSA(TM) can help you develop yours. DogParksUSA(TM) was founded by Susyn Stecchi in 1996. While working for Dr. Steven G. Paul, a Coral Springs Florida veterinarian and visionary, she was tasked with helping to develop the very first public dog park in Florida. The dog park was ultimately approved by the City of Coral Springs and opened, breaking through the barriers to opening dog parks on publicly owned property. Once word got out that the dog park had been opened, people started to call the animal hospital and ask for information and help on how they did it so they could open dog parks in their own communities. Susyn mailed and faxed them information, but the requests got to the point where Dr. Paul said "I'm not paying you to help everyone else develop their dog parks!". So Susyn told the callers she would put together a basic dog park manual from home and sell it to them for the cost only of the paper to print it on and the postage to mail it to them. The first dog park manual, at just 35-pages, grew to a second version at 60-pages after people called her back with more questions they wanted answers to. Still more questions came in that Susyn got answers to for the 3rd edition, and that is when Susyn realized she needed to start visiting other dog parks to find out what they were doing, and what was working and what was not working, and incorporate that into her dog park manual. In 2010 alone, Susyn visited 160 dog parks in her personal time. The dog park manual "So You Want to Build a Dog Park: A Comprehensive Guide for Municipalities and Private Entities" is now in its 8th edition and a whopping 569-pages. The proceeds from sales of the dog park manual are almost enough to finance the dog park visits. Susyn also created PawedCastTV(TM), the online video division of DogParksUSA(TM), where she will start uploading the footage from over 250 dog parks visited in the past several years. She coined the term Pawed Cast(TM) for these videos! Read more about PawedCastTV(TM) by clicking on the Pawed Casts(TM) tab above. Susyn has also recently created Fido Films(TM), the video training division of DogParksUSA(TM). Fido Films(TM) will be producing a series of training DVDs for those who prefer videos over reading to learn how to develop their own dog park. Susyn's passion is to see a dog park developed in every community. 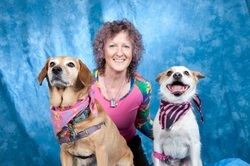 One magazine reporter described her as "the Johnny Appleseed of dog parks." Susyn loves that label so much, she hopes to have it engraved on her tombstone as her legacy!